There has been a recent discussion on the mailing list about synchronization between different mantis instances and “bug replication”. There seem exist already a few home brewn tools to full fill the main requirements, but there is still missing a generalized solution. I have also written some utilities for our special environment, but they are implemented in C++ and Java, as I am not a PHP programmer. They are also using a Web service, but are independent from MantisConnect. This are the reasons why I guess you are not willing to take my code as starting point. So let's start again with the design phase and write down the requirements for a synchronization solution between different Mantis instances in this Wiki page. In the following descriptions there are some links to my Mantis test installation, which can be used as a reference implementation to see a living example of two connected instances with reporting functionality). 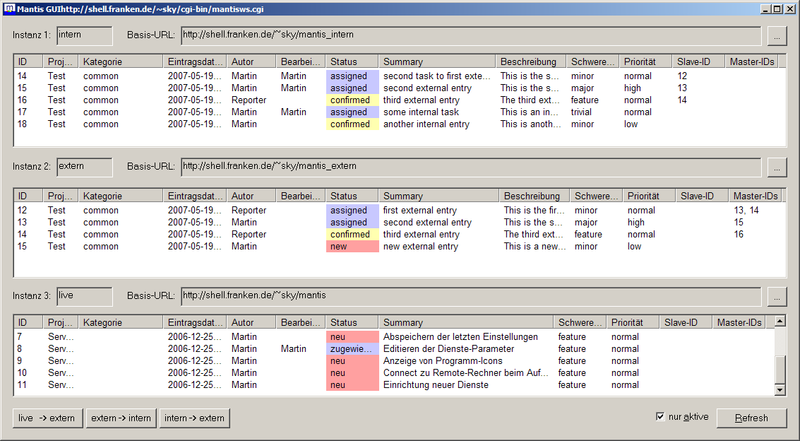 Here is a screenshot of the client application I am using to manually copy the entries of one instance to another. It should be possible to host the two instances on two different machines to separate internal and external networks. The configuration of replication features should be on a per project base, so it's possible for example to activate synchronization only for part of the existing projects. There should be the possibility to configure a mapping for different attributes between the two instances like category, assignees and may be status. Configuration should be available via web forms for users with administrator access. There should be an user interface to manually synchronize entries in both directions. When duplicating entries from the external to the internal instance, it is sufficient to insert HTML links to attached files instead of copying the whole data.
. In the external instance there are stored the IDs of internal entries.
. In the internal instance there are stored the URLs to immediately jump to the external entries. To be able to divide an external entry into several internal subtasks (maybe with different assignees), it should be possible to associate a slave entry with more than one entry in the master instance. When replicating the status from several master entries to the slave instance, the resulting status is calculated as the minimum value of all associated master status values.
. Following Attributes should be displayed on both sides: ID, Status, Severity, Summary. Other columns to display could be configured optionally.
. The list items should contain HTML links to go directly to the related Mantis entries.
. Filtering functionality at least for the status is very useful in this list, for example to get a quick overview of open issues. As Mantis is a PHP application, I think it would be best to implement the synchronisation features also using the same technique. Posting change messages from one instance to another should be possible by issuing HTML requests using a standard protocol like XML-RPC or SOAP. May be it's even possible to use exactly the same protocol like Bugzilla to directly communicate with this system. There are needed one or more new tables to store the mapping definitions for automatically inserted new entries.